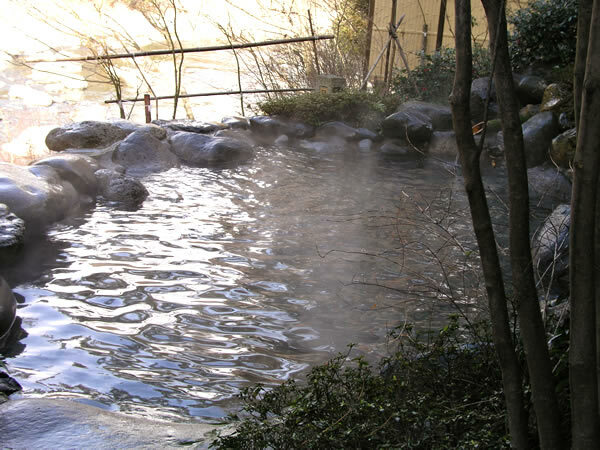 Like a giant sponge soaked full of hot water, Japan leaks from thousands of hot springs. And at some 1,800 of these springs, Onsen resorts have sprung up over some 2,000 years of Japanese love of a good, hot bath. The nation’s hot-spring spas are among its most enjoyable destinations for visitors, and offer a mind-boggling array of variations on the seemingly simple act of soaking in hot mineral waters. Certain once-remote springs were discovered ages past when hunters, pursuing wounded game, tracked the animal down to the bubbling pool where it instinctively went to soothe its pain. Some samurai lords even had favorite hot springs where they would go when wounded in battle to speed the healing process. Until quite recently, Onsen were considered as the provenance of the elderly, who retired to them to soak their arthritic bones. In recent years, however, Onsen have gained a certain cachet among the young, and now most hot-spring spas are popular year-round. While most Onsen pipe their hot-spring waters indoor to their O-furo (bath), some have built pools outdoors, which are known as Roten-buro. These baths are generally open year-round, and are especially satisfying to enjoy during a light snow fall. In Hokkaido, the most popular resort is Noboribetsu. It is situated in a region of magnificent scenery, amid boiling mud pools and sulfuric geysers. Another favorite resort is Jozankei Spa, 30 km. from Sapporo. Among the spas near Tokyo are Hakone, Atami, Ito, Kinugawa, Nasu, Nikko and Shiobara. Beppu in Oita Prefecture, Arima near Kobe and Kusatsu in Gumma Prefecture all provide potent mineral baths, while Masutomi Spa in Yamanashi Prefecture and Misasa Spa in Tottori Prefecture are all well known for their radioactive springs. Shirahama in Wakayama Prefecture and Dogo in Ehime Prefecture are both noted as time-honored hot-spring resorts of Japan. Unzen in Kyushu, famed for its great thermal activity, is also popular as a summer resort. Chief among the mountain spas in Honshu are Akakura in Niigata Prefecture and Zao in Yamagata Prefecture.